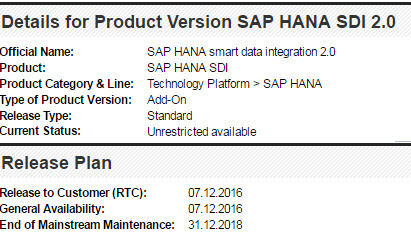 This current blog will provide step-by-step instructions on how to set up SDI for your HCP trial account, anyone can sign up for such a trial account and get started with HANA and smart data integration. We’ll cover the end to end process until you see some sample data from an onPremise source (we will use a file for simplicity). in your HANA database on HCP. Once you reach this stage, you’ll be able to extend it yourself to more advanced scenarios. Keep in mind that trial databases will auto-shutdown in 12 hours and the whole instance gets deleted after 7 days of inactivity. You can check the blog mentioned above, and especially the comments to that blog for details and updates. Go to https://hanatrial.ondemand.com and register for a free trial account (if you don’t have one yet). Login to this account. Database ID: a name you choose for your database (must be lower case, no special characters). Web Access : keep “On” value. DP Server : switch to “On”. This is the Data Provisioning server, the server component for SDI. By default this is “Off”, so make sure to switch this to On. You will not be able to use SDI without DP Server enabled. 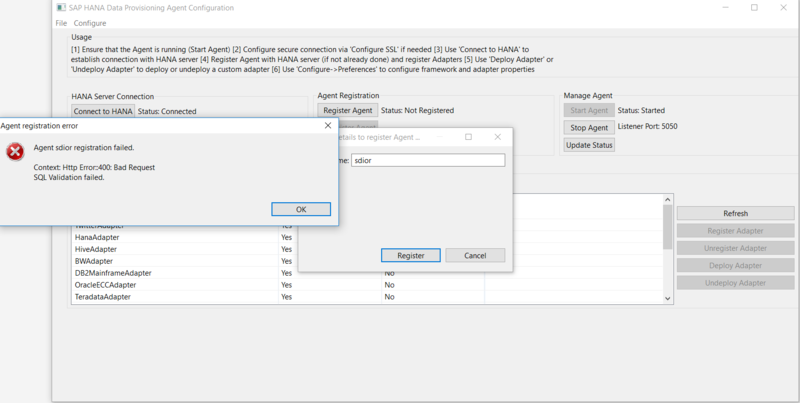 In MDC HANA instances it’s not possible to switch on SDI in the tenant itself, like you could do for a regular HANA database, so this screen during the tenant setup is the only way to enable DP server in your tenant. It will take a few minutes to create the HANA database.But once it’s available you will see the database in this list of Databases & Schemas and can open it. There will be direct links to the SAP HANA Cockpit and the SAP HANA Web-based development Workbench. Click the link to open the SAP HANA Cockpit and login with the SYSTEM user, this will trigger some scripts to assign additional roles and permissions to the SYSTEM user. There are 2 software components you need in order to start using SDI: the data provisioning agent (either for Windows or Linux) and the delivery unit (DU). Both can now be obtained from https:\\tools.hana.ondemand.com. On the HCI (HANA Cloud Integration) tab you will find the downloads under the “Data Integration downloads” section (scroll down on the page). When you click the download link you will need to accept the SAP Developer license (so the agent is only provided for demo/test usage, no productive use allowed), before the actual download starts. Both the Data Provisioning Agent and the Deployment Unit are .tgz files. The Data Provisioning agent download file will need to get unzipped with your favorite tool before you start the installation (step 5), the deployment unit tgz file will be used as-is in the next step. The SDI delivery unit needs to be imported in your HANA database in order for the agent to communicate over HTTPS to your data provisioning server. The same delivery unit will also add the SDI monitoring user interface.You will need the downloaded .tgz file from the previous step which will be named like HANAIMDP-1.2.2.tgz or similar (version number will change in the future when updates are made). The HANA trial instances currently don’t have the web based Lifecycle Management UI installed, so for this step you need HANA Studio. All next steps can be executed in both Studio and Web IDE, but we will use Web IDE where possible in this series). Once in HANA Studio, create a connection to your HANA database on HCP. Select file from “Client” and browse to the .tgz file with the delivery unit. Just search for SAPCAR. There might be multiple versions, any version should work. I see the latest on service market place is 7.21. But any version would work. In order to use it, you need to open a command window (cmd.exe) and use the syntax I have in the blog. So double clicking or running the SAPCAR.exe will indeed not do anything, there’s no UI for it. You need to pass the parameters via the command line. Where do you get the .tgz file after you complete the SAPCAR extraction? Which you are importing in Step 3. This part is confusing. Is this step after installation of data provisioning agent or before it? We have made some improvements to the dowload page. The requirement to use SAPCAR is gone, we now have regular .tgz files that can be unzipped with any program. I also updated the blog with this new info. 1/ agent -> used to be a SAPCAR file, now a tgz. Once unzipped you will filnd a .exe to install the agent as explained in step 5. 2/ delivery unit -> this is and was a .tgz file. This .tgz file is imported as-in into HANA through HANA Studio as explained in step 3, no need to unzip first. Thanks Ben for putting the relevant files for the agent. However, while connecting through the Data Provisioning agent, I am getting a popup saying that “Ensure that the EIM Data Provisioning delivery unit is deployed. Refer to SAP HANA EIM Admin guide for details” . Can you let me know where we can get the EIM delivery Unit? Dave, you will find the delivery unit / deployment unit on the same page as where you download the agent (tools.hana.ondemand.com). Thanks for the steps. I was able to download the DP agent file. I was also able to unzip the file using WINZIP. But unfortunately when I try to install I get below error. Installation configuration DTD file ‘C:\Users\—\Downloads\installer.DPAgent-1.2.7-tgz-WIN_X86_64\installer.DPAgent-1.2.7-tgz-WIN_X86_64\HANA_DP_AGENT_20_WIN_X86_64\packages\installcfg.dtd’ not found. But I can see that this file installcfg.dtd is present at this location. I tried this on two different computers but I got the same result. Any idea what could be missing? The path/file name seems very long, maybe that’s the reason for the file not found error ? Try to unzip into a location like C:\Install to limit the total length of the path name. Is there any other way to get hold of these files. I tried to download this package 3 times now thinking it could have got corrupted. Also I tried using another Unzip application other than Winzip. I think I have approached a dead end here. I am trying to install the dpagent….which “domain\user” do I use and what password? This is either a Linux user if you are installing on Linux, or a Windows user if you are installing on Windows. This user will be used to run the DP agent service once it is installed. I got everything to work with a new database, but we also have an existing HCP database which does not have DP-SERVER enabled and no clear option to edit or turn it on, do you know if this is possible? If you’re HANA instance is a non-MDC instance, you can enable the DPserver via HANA Studio. See step 2 in the blog above. SDI is bi-directional if I understand it correctly. Does this mean that I can replicate SAP data to HCP and also push changes in a HCP HANA database back to the SAP back-end on premisse system? SDI cannot push the data in real-time from HANA to remote targets, it’s always a batch/schduled process. In configuring DP Agent with HANA-MDC on HCP, getting below errors in importing DP Delivery units. ‘sap.hana.im.dp.permission.hdbti’ Schma could not be resolved. Moreover, HANA Cockpit Acces from HCP is throwing 404 Not Found Error. We have a question, SDI will end of support soon? Thank you for this great Blog. Everything worked fine for me but in the last step I got this error while trying to register the agent. Thank you for your reply I already unchecked ‘Use HTTP proxy’ and specified the HANA port as 443 while connecting (connection is fine) but problem with regestring the adapter. I know this is old post, but I am trying to locate the Database & Schemas in the login page of my HCP trial account. I wish to start learning the Hana Smart Data Integration following blogs on SDN. I have posted a question for same here – https://answers.sap.com/questions/375270/issues-in-setup-sdi-for-my-trial-account.html. Please help with your inputs. Is it also possible to enable SDI for HANA on CF?